Drug testing has never been easier! 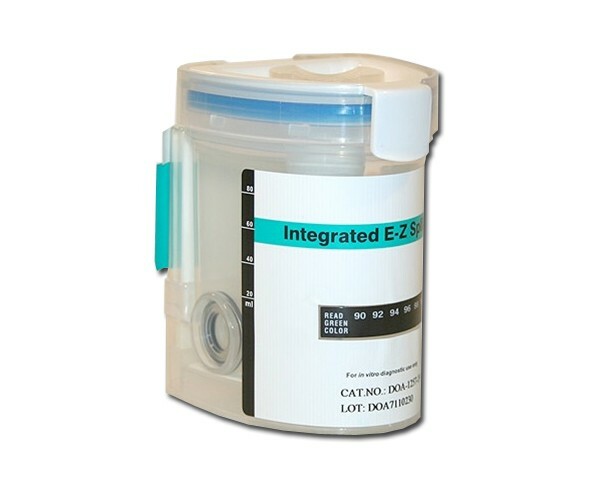 The Disposable Drug Test quickly and cleanly analyzes urine sample and displays results right on the front of the sample cup. This one step drug screen test is performed without the use of an instrument. The test utilizes a monoclonal antibody to selectively detect elevated levels of 5 of the most commonly used and abused drugs. Test results also indicate sample temperature and the presence of any "cover up" additives such as bleach and peroxide. Test accuracy greater than 99%. Step 1. Cocaine: A potent central nervous system (CNS) stimulant and a local anesthetic. Step 2. Amphetamine: A schedule II controlled substance available by prescription and is also available on the illicit market. Step 3. Marijuana (THC): When smoked or orally administered, it produces euphoric effects. Users have impaired short term memory and slowed learning. Step 4. Opiate: Any drug that is derived from the opium poppy, including the natural products, morphine and codeine, and the semi-synthetic drugs such as heroin. Step 5. Phencyclidine (PCP): Also known as "Angel Dust", is a hallucinogen that was first marketed as a surgical anesthetic in the 1950s. It was removed from the market because patients receiving it became delirious and experienced hallucinations.